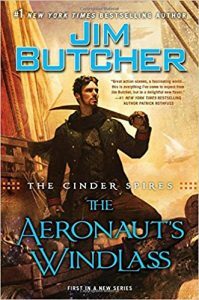 I picked up The Aeronaut’s Windlass, by Jim Butcher, with the intention of broadening my fantasy reading horizons. I chose it mostly by cover, since I hadn’t read any Jim Butcher books before (I might have been living in a hole). The cover had a swashbuckling character and talked of airships, and I’ve enjoyed a couple of books lately that are not exactly steampunk but have that wild west airship clockwork thing going on (in particular, Steal the Sky by Megan O’Keefe – I’ve been waiting for the next one and it looks like it’s out!). I can add The Aeronaut’s Windlass to that list of books enjoyed. It’s an interesting story with compelling characters. And the title has two, count ’em, two great words. It also had a lesson for our times (possibly coincidental): just because something is reported doesn’t make it true. I have a friend who was serendipitously reading it at the same time. She struggled with it and eventually abandoned it. One of the things that she took issue with was the fact that this was a world where women weren’t equal. I didn’t have a problem with that, but I’m okay with my fantasy reflecting reality. Some people are still more equal than others, even in my exceptionally fortunate bubble. The female characters held their own, fighting and thinking alongside the men – and the men either accepted that from the start or learned their lesson along the way. I liked the portrayal of the women as smart and strong and quirky. There were a couple of times at the end where it seemed like it might be slipping into “soft female in need of protecting”, but it might just have been accepting that there’s “soft human” and we need to allow men to express that side of themselves as well, in addition to allowing women to be strong. And it might be setting things up for the next book in the series, which I plan to read. As I said, I like the female characters in the book. One of my favourites is Folly. I liked her growth path through the book. And she demonstrated a real-life lesson for us all – there can another dimension to someone that others might consider weird or downright off, but ends up being that person’s strength. Looking forward to reading the next one…in both these series.